Continuing our week-long travels through the Upper Midwest, day three consisted of a loop from the Minneapolis/St. Paul area south on Interstate 35 to Albert Lea, across I-90 to La Crosse and Portage, north along the I-39 & U.S. 51 corridor to Wausau and a return to the Twin Cities by way of Wisconsin 29 and I-94. 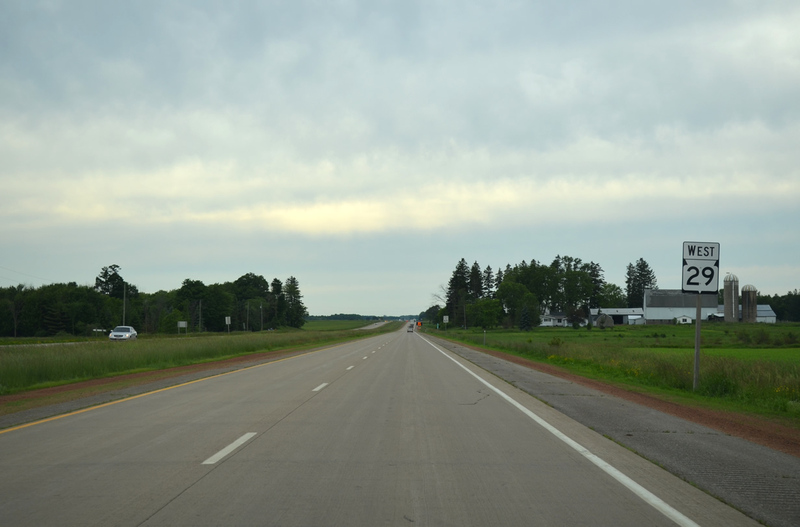 The first leg of the nearly 750-mile loop took us south along Interstate 35 through to Albert Lea. We stopped briefly in Faribault and drove a portion of the business loop, one of two for I-35 south of the Twin Cities, then continued on in rain toward Albert Lea and Interstate 90. Preparing to depart for Minnesota 21 and the I-35 Business Loop into Faribault. Designated by local officials in 2003, the business loop runs along Lyndale Avenue between Exits 59 and 55. 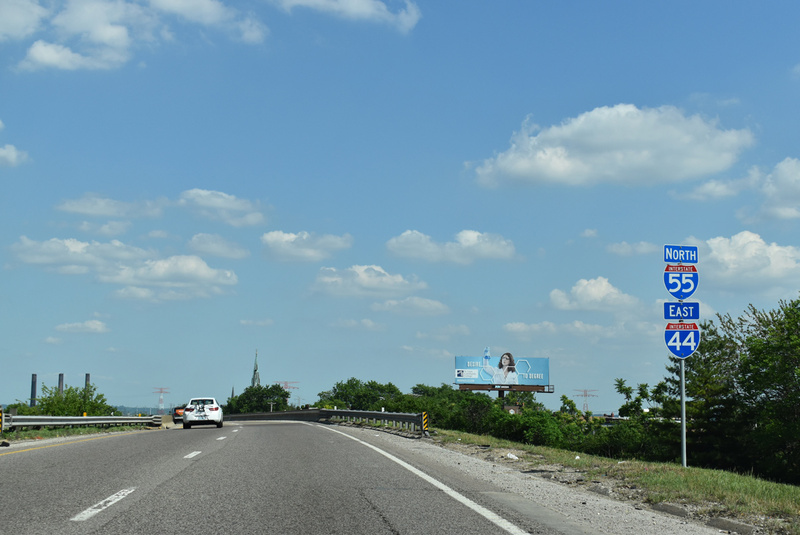 Though a designated route, signage for the loop is only present at the Exit 59 interchange along I-35. 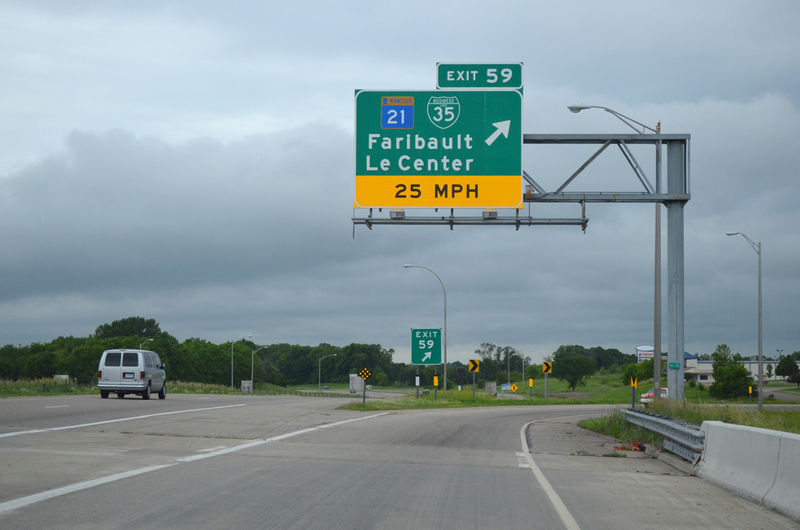 Two construction projects between Faribault and Albert Lea currently reduce I-35 to two-way traffic. In Owatonna bridges are being replaced and auxiliary lanes added between from the Hoffman Drive interchange (Exit 42AB) to south of Lemond Road. Another project between Ellendale (Exit 32) and Interstate 90 (Exit 13) sees concrete repaving on the southbound lanes. 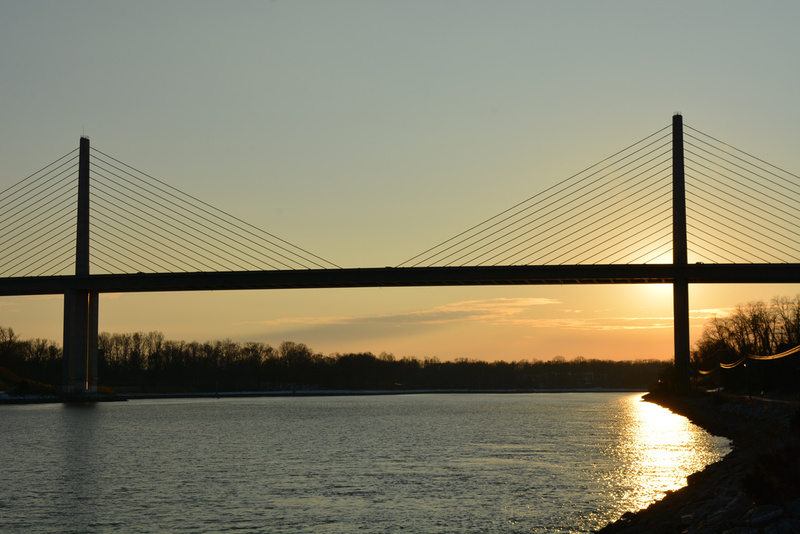 Both projects are expected to be complete Fall 2015. 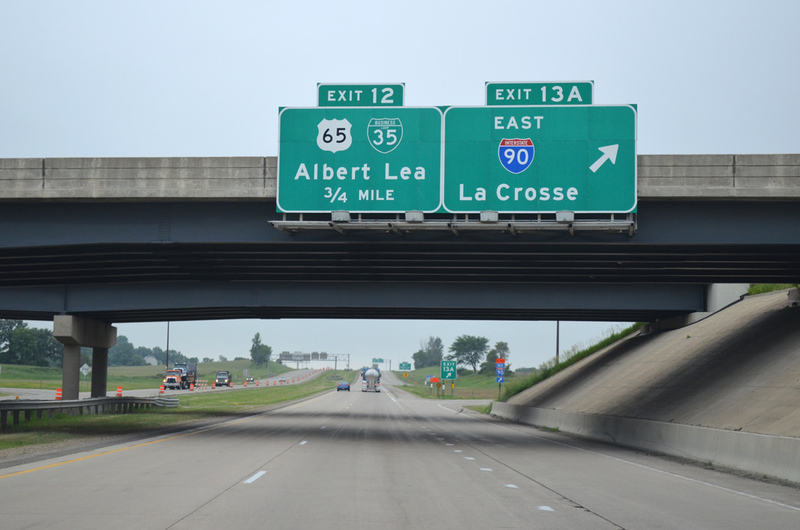 Interstate 35 meets Interstate 90 northeast of Albert Lea at a full cloverleaf interchange (Exit 13AB). As part of the concrete repaving project along I-35 south, the ramp to I-90 west is closed, forcing a temporary detour using the three remaining loop ramps to access westbound. 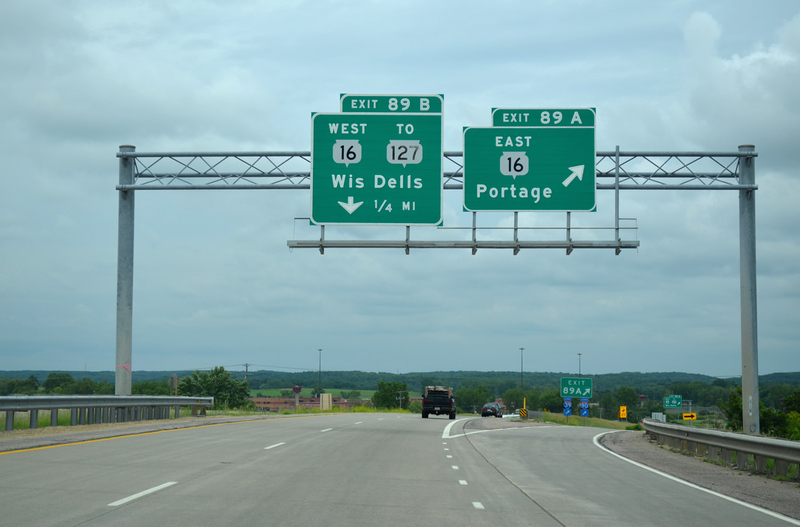 U.S. 65 sees its beginning 0.75 miles south of I-90 at a wye interchange. Another business loop for I-35 follows U.S. 65 through the central business district of Albert Lea meeting the interstate at a folded diamond interchange (Exit 8). 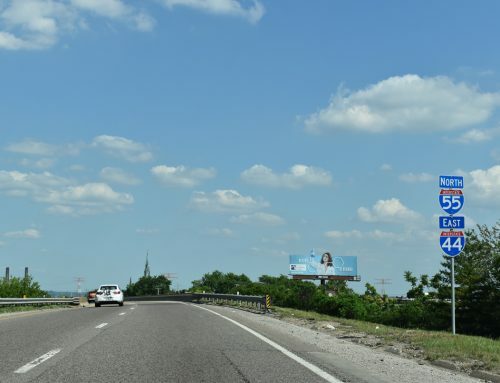 The U.S. highway continues 992 miles southward to its end in Clayton, Louisiana. First southbound reassurance shield for U.S. 65 and the I-35 Business Loop heading in to Albert Lea. 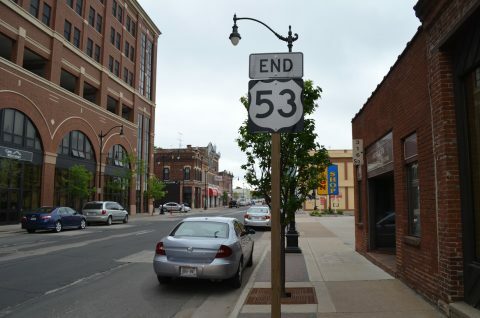 The loop travels the entire length of U.S. 65 through Albert Lea, a distance of 5.7 miles. Olsen Drive briefly runs parallel and represents an old alignment of the U.S. highway. 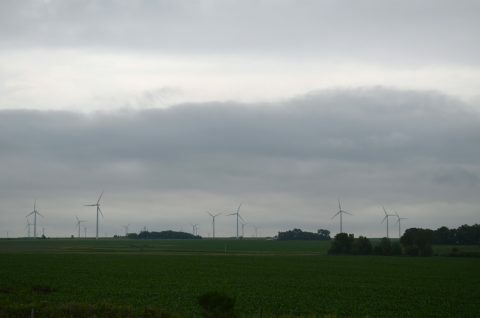 Wind turbines stand scattered across rich farmland on the approach to Minnesota 16 (Exit 193) along I-90 east. 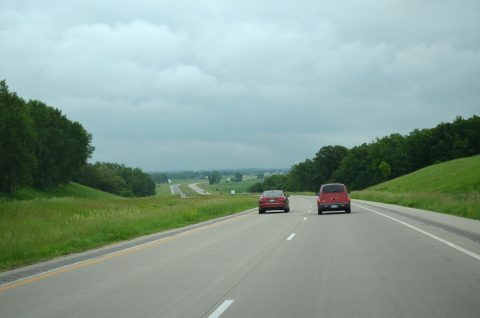 Interstate 90 between Albert Lea and the state line traverses gently rolling landscape and farmland. Beyond Minnesota 16 (Exit 193) the distance between interchanges stretch out allowing for a more scenic drive through the southeastern part of the state. 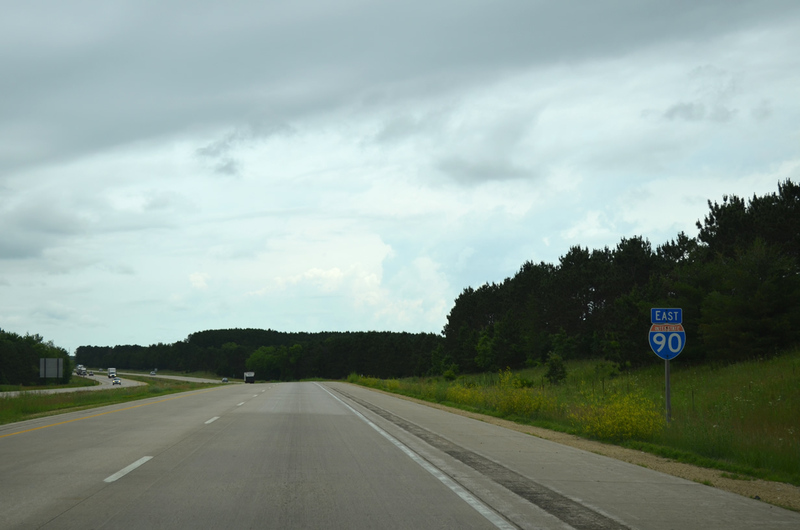 The final ten miles of Interstate 90 are in stark contrast to the previous 100 miles. Beyond Exit 267 the freeway straddles valleys and creeks as it descends toward the Mississippi River. Typical scene along I-90 east on the approach to the Mississippi River and Wisconsin. The town of Dresbach lies directly below the freeway adjacent to it and the river. 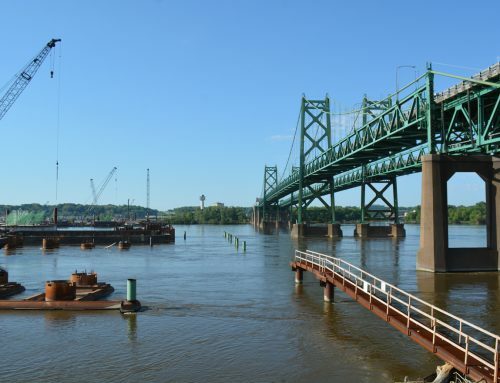 The Dresbach Bridge project will see the existing structure that carries I-90 across the Mississippi River into Wisconsin replaced with twin spans, as well as an improved interchange with adjacent U.S. 14 & 61 (Exit 276). Scheduled completion is set for sometime in 2016. 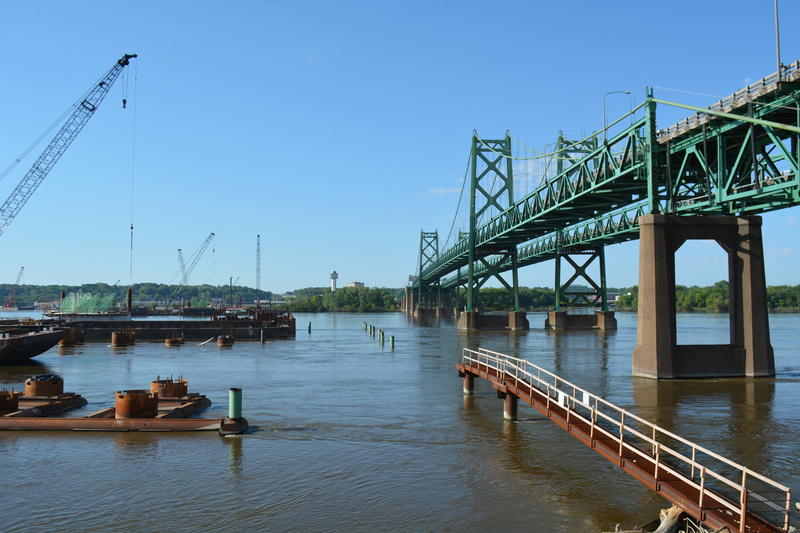 The new spans are being built just to the north of the 1968 span. 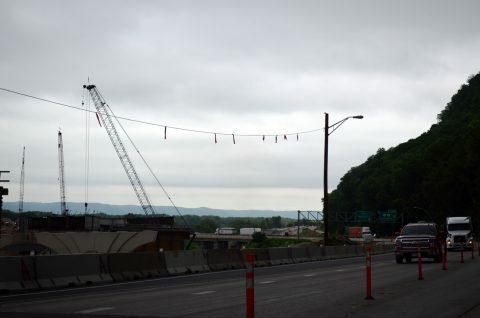 The mainlines for Interstate 90 are being realigned for improved access to U.S. 14 & 61. 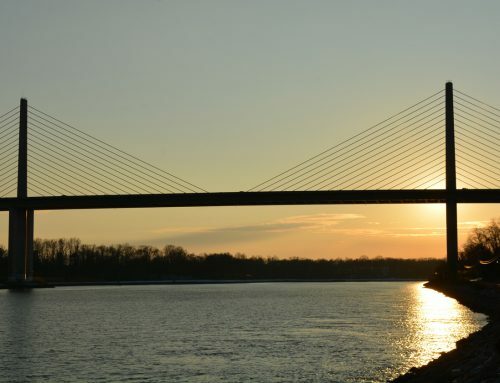 The final configuration of the interchange will involve free movement between the freeway and U.S. highways, including a direct fly-under ramp from westbound I-90 to southbound U.S. 14 & 61. 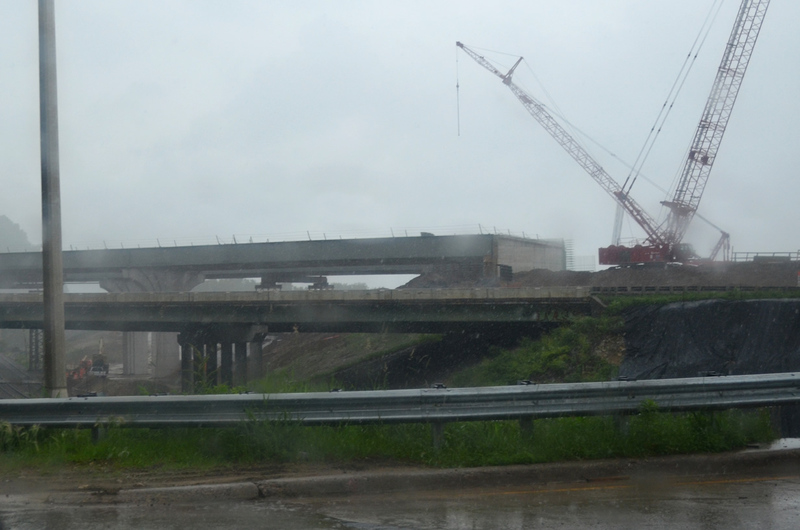 Rain-soaked look at the progress on the new mainline overpasses from the U.S. 14 west and U.S. 61 north ramp to I-90 east. 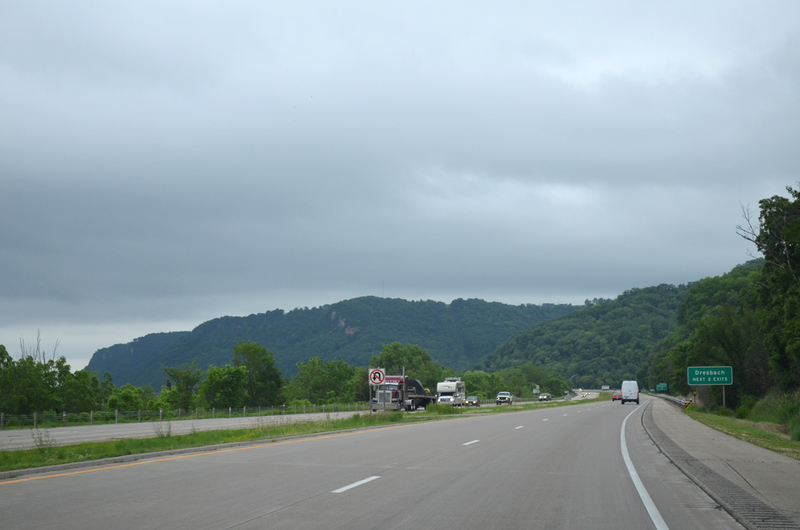 Through the periodic rainfall, we dipped into La Crosse by way of U.S. 14 & 61 to take a look at downtown and visit the southern terminus of U.S. 53. 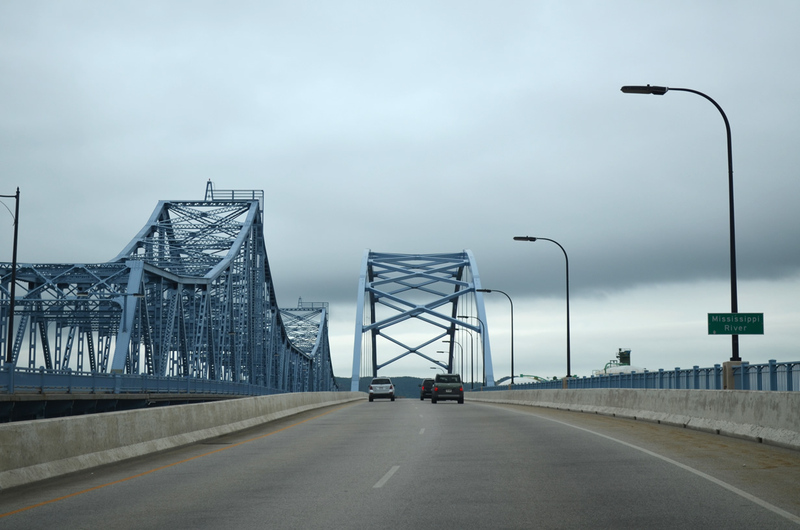 Both U.S. 14 & 61 enter Wisconsin and La Crosse using the Mississippi River bridges. 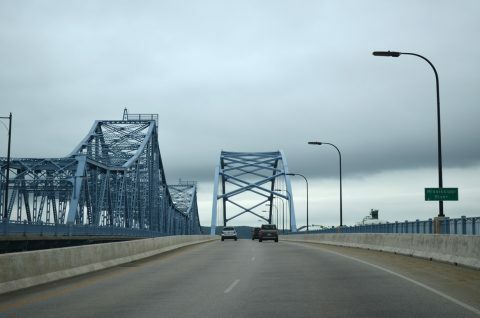 The steel truss span opened to traffic July 1940 and currently carries westbound traffic. The newer arched span opened November 2004 and takes motorists and U.S. 14 & 61 into La Crosse. 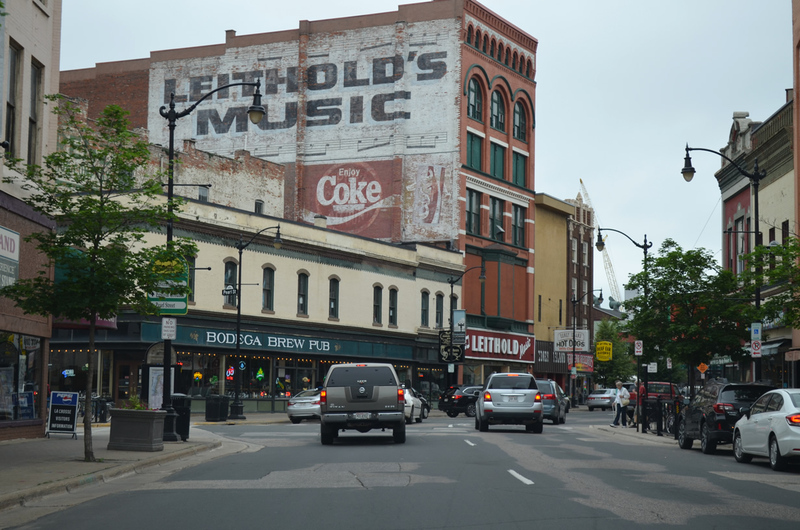 A view along U.S 53 north (4th Street South) in downtown La Crosse. 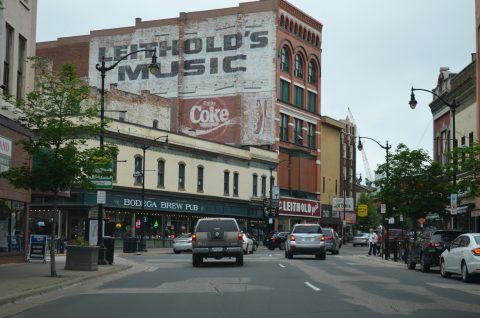 The Bodega building in the foreground was originally built in 1876 as three separate structures and combined by 1926 while the Doerre building (east side of 4th Street) was constructed between 1884 and 1894. 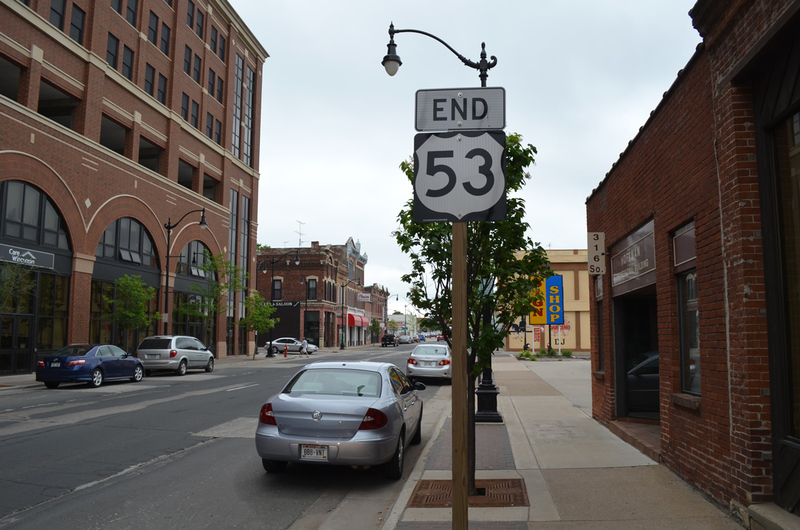 This end assembly precedes the southern terminus of U.S. 53 (3rd Street South) at U.S. 14 & 61 and Wisconsin 16 (Cass Street) in La Crosse. Interstate 90 continues into Wisconsin as a rural highway passing near to Bangor, Sparta, and Tomah before merging with I-94 east. Farmland graces the roadside on the first part while a wooded landscape unfolds east of Sparta. 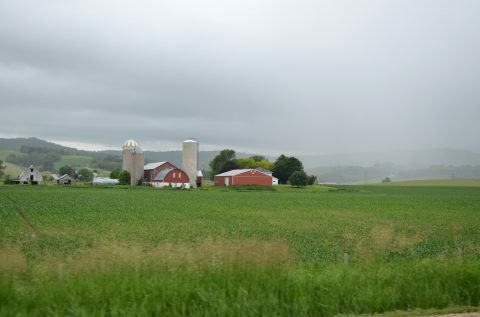 A rain shaft bears toward this farm and crop field along side Interstate 90 between Wisconsin 162 (Exit 15) and Wisconsin 27 (Exit 25). Interstate 90 continues eastward from Wisconsin 27 (Exit 25) to the second Sparta exit with Wisconsin 16 (Exit 28). Tomah lies 16 miles ahead. 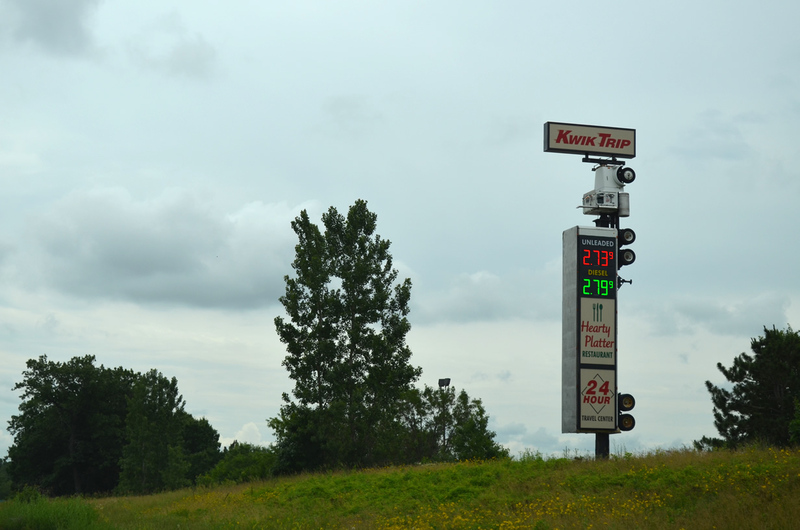 This unique tractor trailer electronic fuel price sign lines the eastbound I-90 & 94 at Wisconsin 82 (Exit 69) in Mauston. Button-copy signage is still abundant on the portion of Interstate 39 between the split with I-90 & 94 to north of the U.S. 51 merge (Exit 92), as evident at Exit 89AB to Wisconsin 16 and 127. 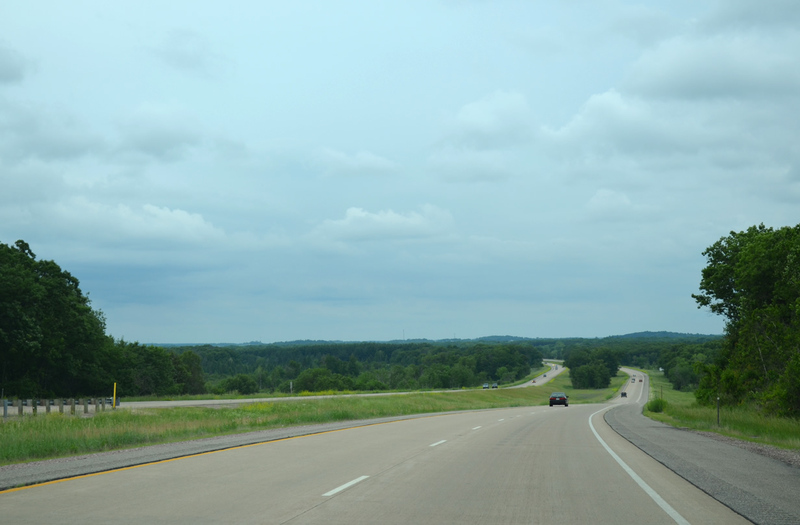 Much like Interstates 90 and 94 in western Wisconsin, I-39 and U.S. 51 travel through rolling landscapes as the duo head toward Stevens Point and Wausau. 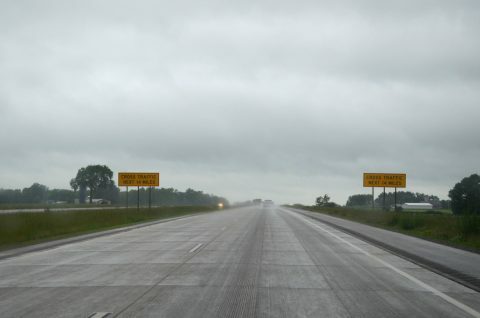 Spanning six years and several segments, a new 31-mile U.S. 10 freeway/expressway system was completed in 2012 between Interstate 39 and U.S. 51 (Exit 165) north of Stevens Point and Marshfield. 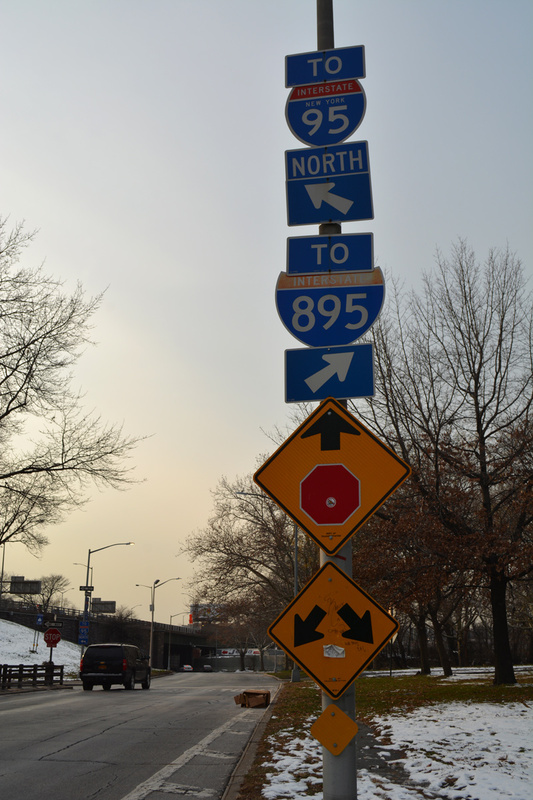 The majority of the route features limited at-grade intersections with interchanges at key points between the two destinations. 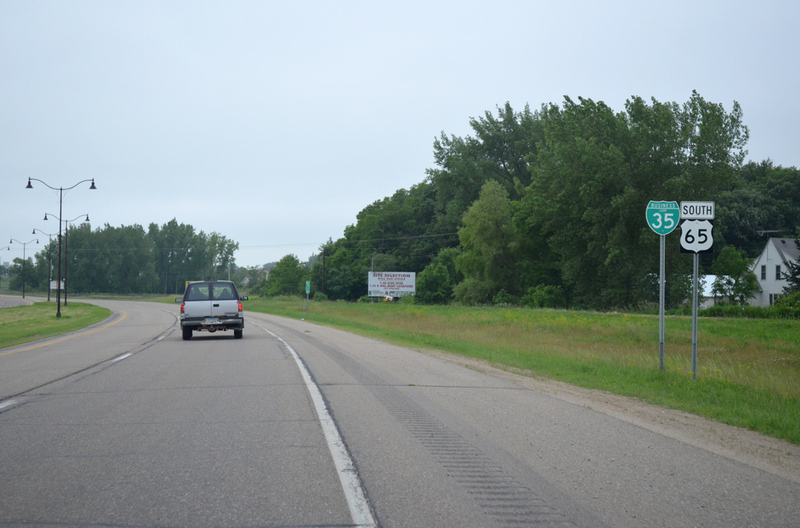 Leaving I-39 and U.S. 51, the U.S. 10 freeway travels westward toward Auburndale and Marshfield. 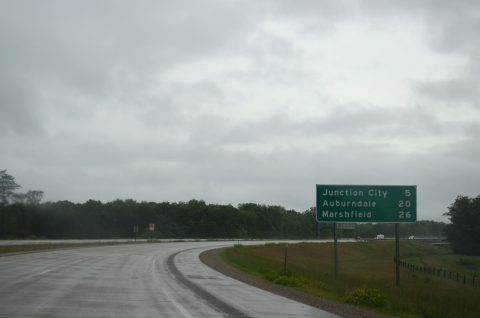 Junction City is accessed via the upcoming diamond interchange with Wisconsin 34 (Exit 208). One mile west of the merge with Wisconsin 13 north (Exit 204), the freeway portion of U.S. 10 ends. The remaining 14 miles consist of at-grade intersections with cross traffic. 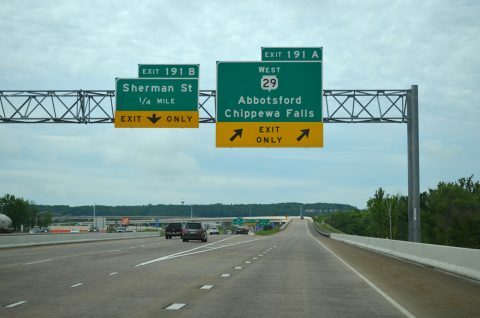 Only one additional interchange was constructed on this stretch and occurs at the split of Wisconsin 13 north to Marshfield. 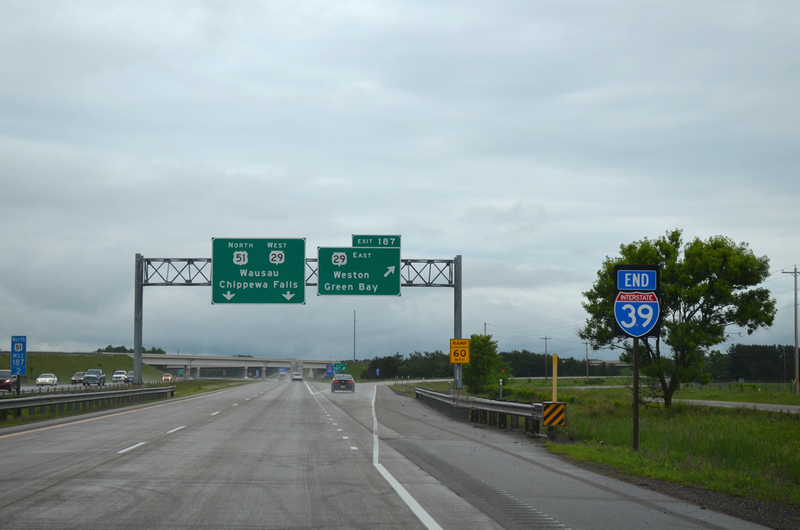 Interstate 39 comes to an end at a directional interchange with Wisconsin 29 east (Exit 187) near Rothschild. 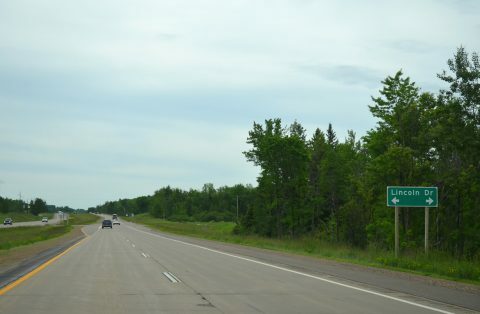 The freeway continues U.S. 51 and Wisconsin 29 northward five miles to Wausau before the state trunk highway departs west to Chippewa Falls. The freeway extent of U.S. 51 transitions into an expressway north of Merrill. Lincoln Drive is one of several at-grade crossings on the portion between the end of the freeway and the short freeway segment around Tomahawk. 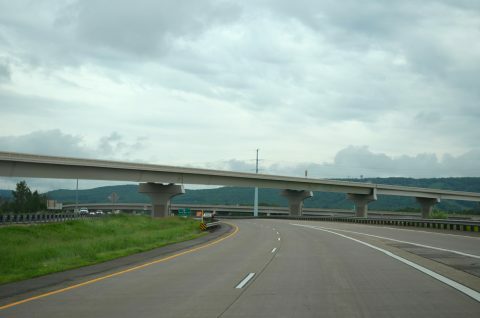 As part of a six year overhaul, a direct freeway-to-freeway connection was built between U.S. 51 and the west branch of Wisconsin 29. 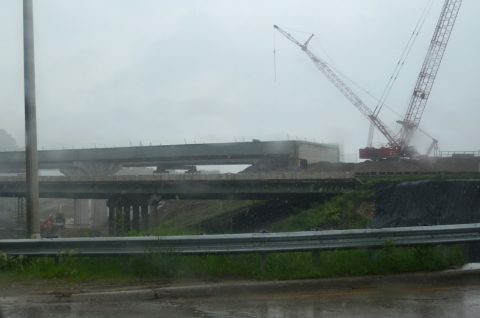 Prior to completion in 2010, drivers eastbound on the state trunk highway met U.S. 51 at the Sherman Street diamond interchange. 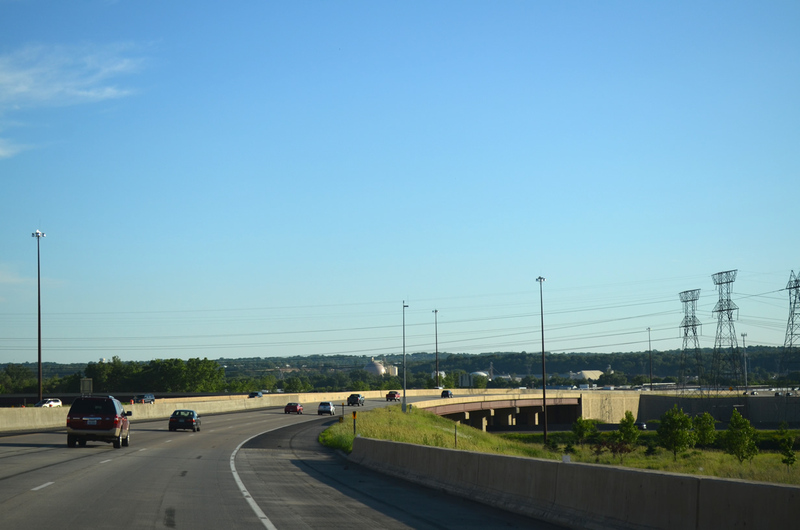 A look at the directional exchange with Wisconsin 29 west from the perspective of U.S. 51 south. 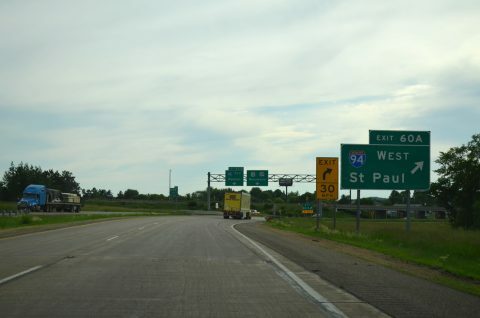 Wisconsin 29 west leaves the U.S. 51 freeway at Exit 191A ahead of the Sherman Street (Wisconsin 52) diamond interchange. 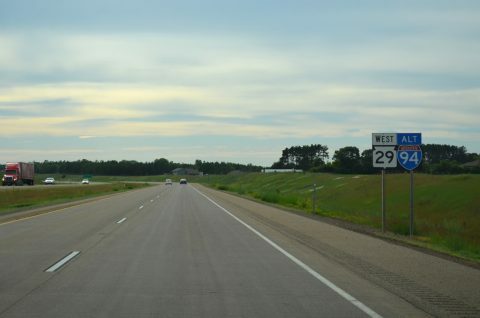 Heading west on one of the expressway portions of Wisconsin 29 beyond Marathon County F.
Wisconsin 29 between U.S. 53 and Interstate 94 also serves as an alternative for Interstate traffic during emergency and winter conditions. The current exchange between Wisconsin 29 and I-94 & U.S. 12 consists of a parclo, but future plans by WisDOT call for a system to system interchange between the two corridors at a new location north of the existing one. No time table for this project has been established. Traffic departs to Interstate 94 west from Wisconsin 29 near Elk Mound. U.S. 12 joins Wisconsin 29 for the duration to Menomonie before departing northwest toward St. Paul. 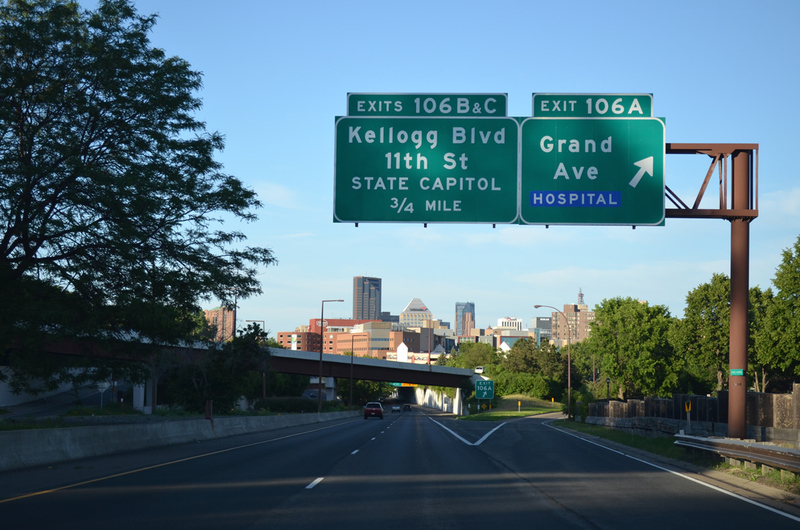 Concluding the loop back to the Twin Cities area, we traveled west on I-94 back into Minnesota and revisited portions of I-494 & I-35E through to Downtown St. Paul. Interstate 494 curves southwest toward the Wakota Bridge and Mississippi River as it passes over the U.S. 10 & 61 interchange in Newport. 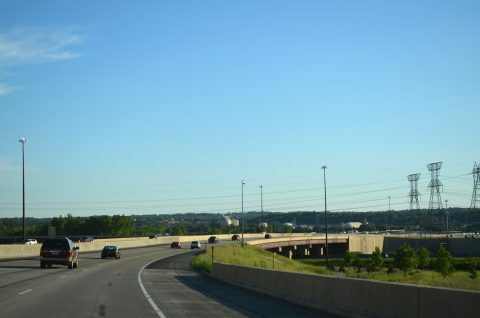 A piece of the downtown St. Paul skyline comes into view along the parkway portion of Interstate 35E near Grand Avenue (Exit 106A). 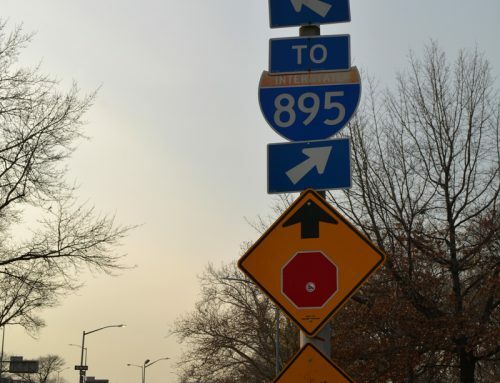 Use the 11th Street ramp (Exit 106C) to reach the State Capitol. The next update will summarize the trip from Minneapolis/St. Paul northwest to Fargo, North Dakota and the Canadian border via Interstate 29.